fun little lunch for one of my wee Valentines. so this lunch was eaten at home. 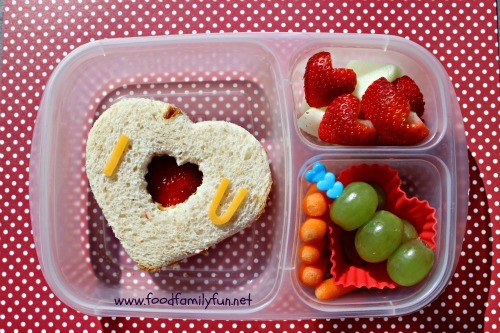 I <3 u sandwich is a simple strawberry jam and peanut butter sandwich with a heart cutout and some cheddar cheese toppers. You might see the peanut butter if you look really closely, it's under the top slice of bread. This sandwich could not have been easier to make. Cut out the main heart shape, cut a mini heart out of the middle of one slice. Spread the bottom slice of bread with jam and the top slice with peanut butter. Top with the cheddar cutouts and voila! Heidi also has honeydew melon cubes topped with strawberry hearts, a few grapes and some baby carrots. We so rarely have baby carrots here in Bermuda. They are fun to try every now and then but I must be honest, our local carrots are the tasty ones! 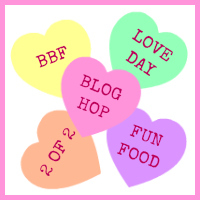 Today's lunch is part of a Happy Valentine's Day lunch blog hop. 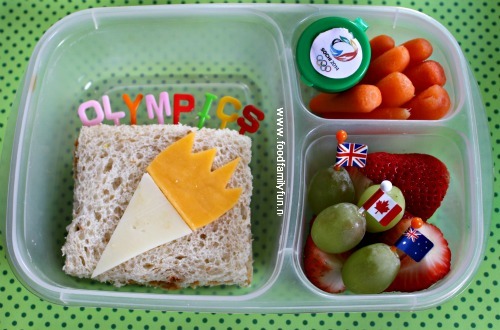 Please click the button to hop over see what Becoming a Bentoholic has made. When you arrive back at my post you will have seen all of the posts in this hop. This hop was part 2, if you would like to see part 1 (that went live earlier this morning) please start here.